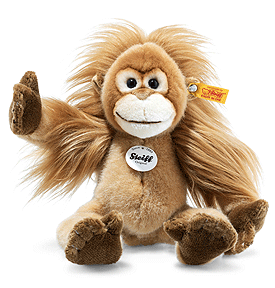 Steiff Elani Baby Orang-Utan is made by hand, in the finest light brown cuddly soft plush. The baby of Alena orang-utan is 28 cm tall and made of soft and cuddly plush fabric. She has long hair on her upper arms and on the back of her head. Her face and the area around her eyes feature a soft cream colour. The hands and feet provide dark brown accents, while the nose and inner ears lend a light brown contrast. A bean bag sewn into her rear ensures that she can sit up straight. She features pretty brown colouring on her face and dark brown on her claws.